Massage Hula Hoop – swing yourself fit! Do you want to lose weight in a sporty and dynamic way and finally feel comfortable again? Then discover one of our effective massage Hula Hoops which offer a beneficial stimulation during the training for the desired stress reduction. Hula Hooping opens up truly spirited ways to lose weight, it strengthens the back muscles and the tissue of the abdomen and hip. With the Large Hoop method, you can also achieve positive effects on the digestion and help the body to carry away pollutants or contaminated waste for effective cleaning. Some massage Hula Hoops even offer an invisible “health value”: Integrated magnets help to activate the body's own healing powers and stimulate the release of endorphins. Since many centuries, it is known that magnetic fields allow a gentle stimulation with respect to a revitalizing change between tension and relaxation. For damping and gentle regulation of the massage effect, silicone has been used (which allows a noticeable air damping system): you will enjoy an even greater exercise comfort and slipping of the Hula Hoop can be effectively prevented. You are interested? Then read more about a peppy and stimulating health movement! This is relatively large hula hoops with a diameter 90-105 cm, consisting of a 25 mm PE pipe and have a minimum weight of 500 grams. These large, heavy tires are much easier to swing and therefore ideal for beginners. By the rather high weight these tires can also be ideal to use as a fitness hula hoops. However, you should be aware that can not be with such tires perform any tricks. For this, in part, smaller and lighter models necessary. 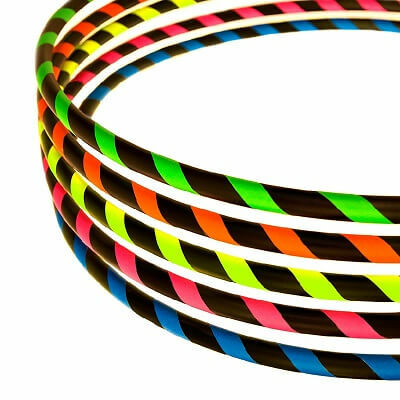 For experienced Hoopers, we offer high quality HDPE Hula Hoops in different diameters (60 to 100 cm) with 20 mm tubes. These Hula Hoops are much lighter than fitness Hoops so that they can be used for a variety of tricks. Basically, as a kind of rule of thumb, you can say that the diameter can be smaller the more experienced the Hooper is. In this spirit, you can discover a wide range of HDPE Hoops in different designs and colors. For professional and impressive performances, we also recommend Polypro (PP) Hula Hoops which can be ordered easily and in different colors. To keep the weight of the tires as low as possible, they are stuck with functional grip tape to ensure a noticeably better grip for the movements. These tires embody a perfect extension in terms Hoop Dance. They are particularly suitable for mini and isolation Hooping. Moreover, these hoops are used for juggling as well as for the arm Hooping. This sporty extension efficiency and variety come to your training schedule. For our little hula hoop fans we have with our children Hoops with a 16 mm HDPE pipe is a perfect solution. The diameter can be selected between 60 and 80 cm, with different styles are available, let the children's hearts beat faster. Whether glitter, hologram or tape with stars, the attractive design of our children hula hoops turns each model into an optical eye-catcher. Which hula hoops perfect for me personally? By choosing a matching hula hoop tire you lay the foundation for successful learning the technique. Note in this regard that the models differ significantly facing weight and height to the part. We would like to point out that this table should be seen as guide. With a suitable diameter and an optimum weight, you should be able to enjoy an optimal training experience. Especially for beginners as well as for pain-sensitive people, we offer in our spirited repertoire more gentle models like the Hoopomania Light Hoop and Weight Hoop: A pleasant foam coating in combination with wavy massage nubs allows a noticeable reduction of the pressure, so that possible bruises in the initial phase should be rather an exception. Your skin and connective tissue are sensitive? We have an effective protection! Please remember that massage Hula Hoops may cause bruises in the starting phase of the training because the tissue is not accustomed to the new stresses. Our Hoopomania shapewear belt is a very convenient and effective remedy which is actively supports the slimming process. 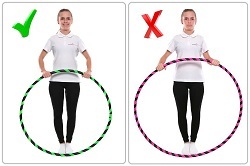 A great importance has therefore to be attached to an appropriate size: Please note the rule of thumb that the Hula Hoop should reach from the ground up to your hip or to the navel. This rule is particularly recommended for beginners who make a good choice with a large and heavy Hoops (i.e. a diameter from 1 meter and a weight of 600 grams). Lighter Hula Hoops, however, are recommended for more advanced Hoopers who want to realize Hoop Dance or demanding choreographies. Experienced Hoopers cope well with smaller and lighter tires. These are more difficult to move. 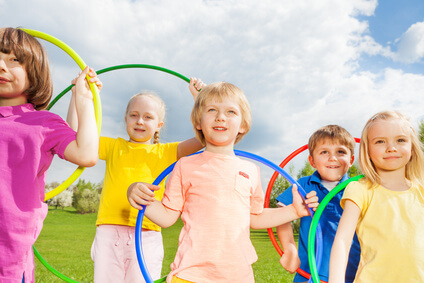 Basically, we want to emphasize that modern Hula Hoops have nothing to do with children's toys: You acquire an effective training tool for a holistic workout with visible and noticeable body effects. For an effective exercise, you should not use a Hula Hoop from the toy department. Understand this table please as orientation because of our experience and not as strict binding statement. For kids, the joy of movement should always be the priority. Therefore, a good fit is an important starting condition. "You also offer you customizable Hula Hoops!" For professionals and experienced Hoopers, we offer handmade HDPE & PP Hoop in different sizes and designs. HDPE (high density polyethylene) and PP (polypropylene) represent a very resilient and robust material which allows the best flexible swing characteristics for Hula Hooping. We have for every hip and for each training goal a quality Hula Hoop for you!